My resolution this year (again!) was to eat less cake and I am doing pretty well at it so far but sometimes it is about using the ingredients you have and the holiday that is at hand. I had egg whites in the freezer and wanted to use them up. Defrost and I have everything else in the fridge or pantry: go daffodil cake. Looks like an angel food cake on the surface but it is an old fashioned confection known as a daffodil cake. The insides have some white and some yellow cake. I found the recipe in my 1970s Betty Crocker, a great standard cookbook I would never want to be without. Was making it for many years before my diagnosis with celiac so once I got comfy baking gf I figured I could make it gf and it is perhaps even better than it was with gluten based flour. I make them on occasion for my mom who is a big fan of said cake. She is still not sure I am making it gf but it is totally gf and totally delicious. So all you gluten free disbelievers, this cake will change your mind. It is tender, moist and delicately flavored, not to mention very pretty and perfect in spring for Easter. It is after all, a daffodil cake and spring is the only time in the year they bloom. Make some now folks! It makes a wonderful birthday or party cake; you could put a thin vanilla powdered sugar glaze on top to make it fancy for such an occasion. Notes: I save egg whites; in a Tupperware container in the freezer, until I have a cup of them. Then I am ready to put this beauty together. Or just use enough eggs to make a cup of whites. If you don’t have guar gum you can use xanthan gum. A few words on separating eggs: this can be tricky and I have learned from bad experiences not to separate directly into the measuring cup full of whites; do it into a small bowl and dump. You can NOT get ANY egg yolk in the whites or they won’t beat properly. Best to set any egg that breaks or becomes contaminated with even a speck of yolk aside and make an omelet for supper! I crack each egg on the edge of my counter, split its shell in half and dump it over one cupped hand. The white flows through into the bowl underneath and I drop the yolk into the mixing bowl. Be gentle so the yolk does not break Don’t use old tired eggs or the yolks are more likely to break; fresh is best but they need to come to room temperature before cracking so the whites beat to a high volume. FYI: When baking gf all ingredients should be room temperature unless the recipe tells you otherwise. Put the yolks in the medium mixing bowl and add those six whites in with the other cup of whites: 1 ½ cup total egg whites. I know, a crazy lot of eggs in this but remember, no fat what-so-ever! Angel food cake is a good choice for your diabetic friends, or so they say. I just think those folks love a good angel food cake. This cake is even better, a masterpiece of delicate melt in your mouth cakey delight. Heat oven to 375 degrees. Put baking rack on second slot from the bottom. You need a ten inch tube pan with removable bottom, do not spray. Mix and sift the powdered sugar, flour, guar gum in a bowl at least once. 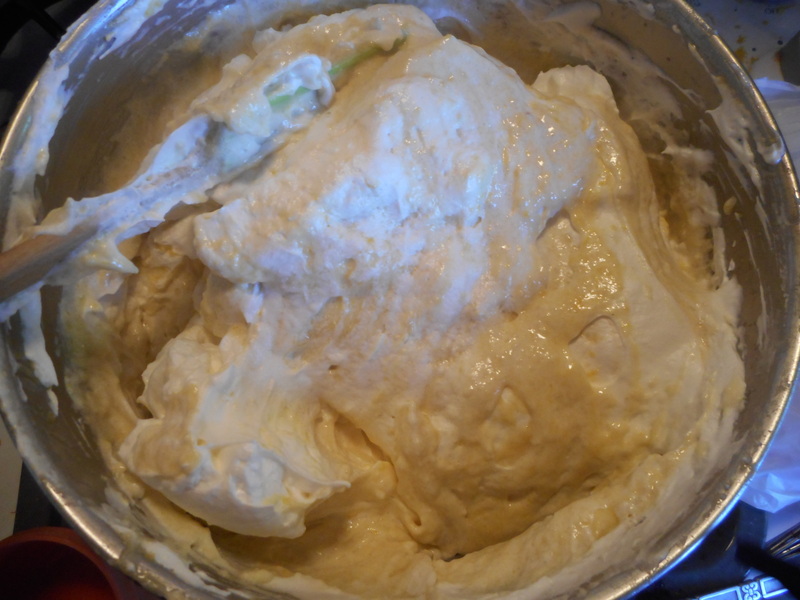 Pour the egg whites (should add up to 1 ½ cups) into a stand mixer bowl, add cream of tarter and salt. Start at medium speed. Beat until foamy, increase speed until high, wait for soft peaks and add cup of granulated sugar a tbsp or two at a time as it beats. No bowl scraping or stopping. Beat at highest speed until you have stiff peaks. Beat briefly after adding the two flavoring extracts. Set aside. In small bowl beat the 6 egg yolks about 4 minutes until thick and lemon yellow colored. Fold the flour mixture into the egg whites, I do about a quarter cup at a time sprinkled all over the top and I fold it with a spatula or spoonula. Be gentle and smooth; don’t worry if it isn’t perfectly smoothly mixed. Put about half of the mixture into a separate large mixing bowl. 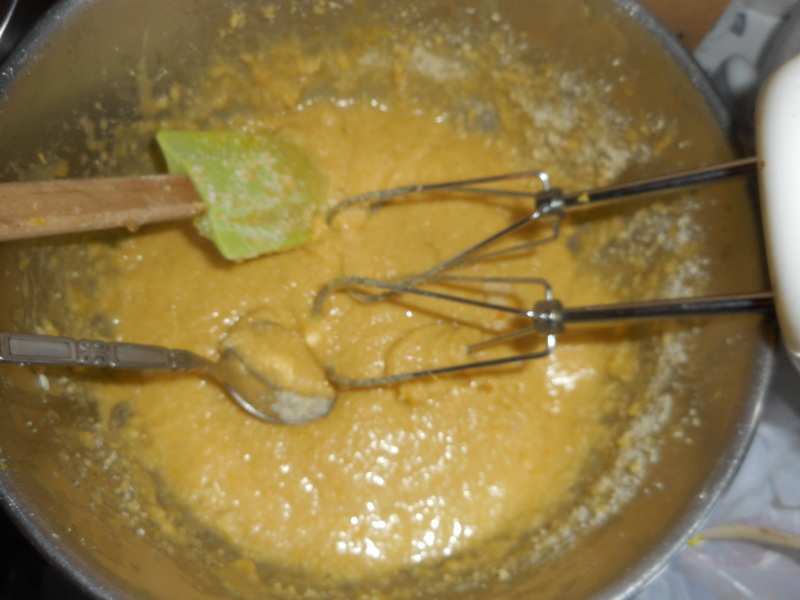 Add the beaten egg yolks; gently fold until it is pretty well blended. 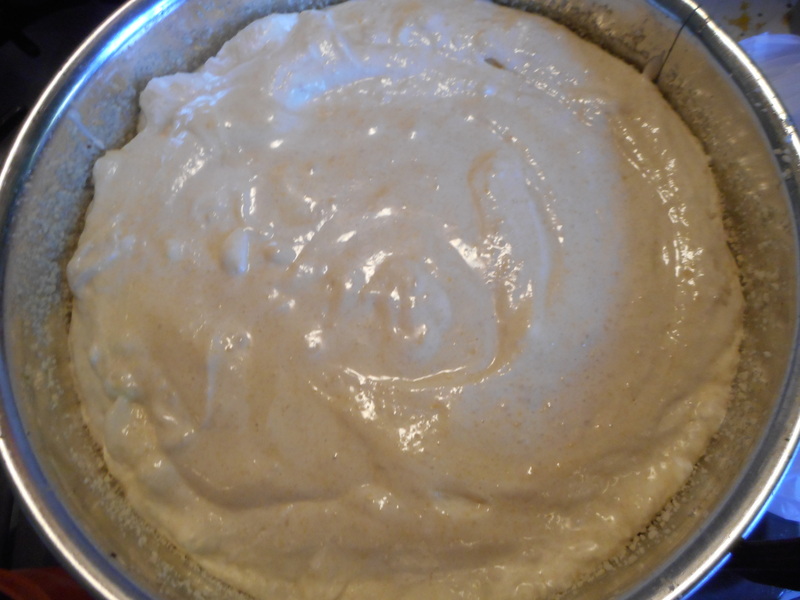 Put big glops of the plain mixture into the baking tube pan; I like 3 big ones. Put three big glops of the yellow blended mix between them. Top with more glops of the mixes, using it all up. Gently stir through the pan with your spoonula to swirl it a bit and smooth the top with the spoonula. Put into preheated oven, bake 35 minutes, until when you press gently on the top it springs back. Remove from oven, turn it over and hang on an empty wine bottle neck or a big funnel. Let cool totally in this upside down state before cutting it out of the pan. I use a sharp serrated bread knife, cut around the outside edge and the center tube. Lift it out and then slice under the cake all around. Place a cake plate over the top and gently flip it. I store it in a plastic cake saver or just in the microwave away from breezes and hungry folks. You could wrap it in plastic wrap too. It is best eaten within 3 days. It generally doesn’t last that long around here. This recipe is my variation on the angel food cake you will find in Annalise Roberts’ Gluten-Free Baking Classics cookbook. This post was first published in April 2016. Cake….always a party pleaser. I enjoy it on special occasions but confess it is not one of the things I am good at baking, never was even when I could use regular flours. And don’t get me started on the birthday cake curse I am crouching underneath. But sometimes you just need that fancy dessert that serves a crowd and makes everyone happy. This cake is fairly easy to make, is gluten free and has great lemon flavor. The honey is more of an undertone. Each bite has a satisfying texture due to the almond flour, not heavy but not light with a lovely moisture built in from the honey and olive oil. The tiny bit of potato starch helps make that great texture. No butter either; extra virgin olive oil does the trick. Make sure your eggs and whites are all at room temperature for maximum loft when whipped. The candied lemon slices take a bit of effort but look great on top. I know I was happy with the results when I bit into my slice of yummy cake! This recipe comes from Food Network’s test kitchens and I made only minor changes, used slightly less water making the syrup as it seemed too thin even after simmering 20 minutes and no pomegranate seeds for on top; it is spring and pomegranates are a fall fruit. I looked; none to be found. I used a half pint of fresh raspberries and they were perfect – added great color and flavor. If you can get Meyer lemons they are recommended because of their awesome flavor but I used the usual ones from the grocery store and they worked out fine. I thought the candied slices were tasty although a couple of guests who didn’t much like lemon skipped their candied lemon while still enjoying the cake itself. 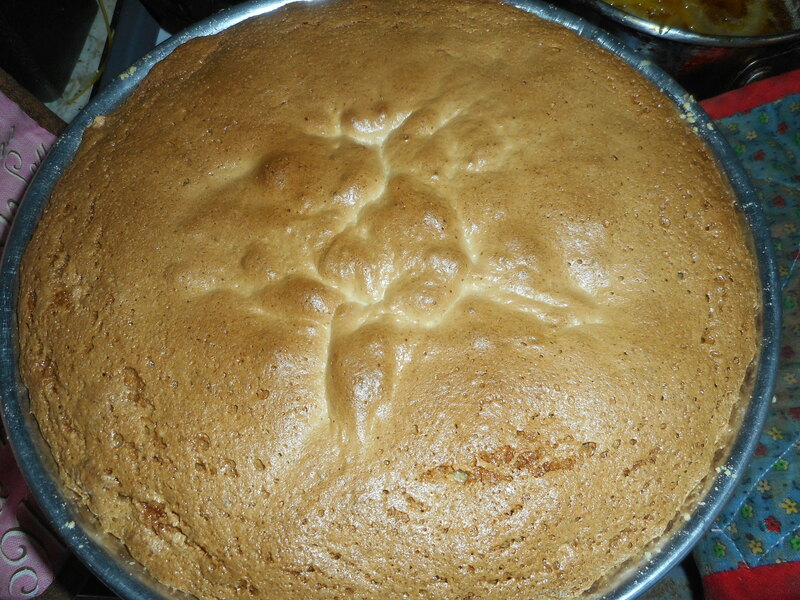 It is a very impressive looking cake with a tender moist texture. Extra syrup on top is a tempting option! I put all my pictures together in a chunk; they can be annoying sprinkled through out the recipe when you are trying to make it. I often use my tablet to make my own recipes straight off my blog posts so I know what I am talking about here! Brush the sides and bottom of a 9 inch spring form pan which you lined the bottom with a round of parchment paper; brush with EVOL and dust with almond flour. Put rack in middle level in oven. Heat oven to 325 degrees. Mix flour, starch and salt in medium bowl. Combine ½ cup sugar, 1/3 cup honey, lemon zest, 4 egg yolks, vanilla and almond extract in mixer bowl. Mix on medium high until creamy; about 3 minutes. Reduce the speed to low, beat in the flour mixture just until blended. In a separate clean bowl beat the 6 egg whites until foamy, about a minute. Gradually beat in ½ cup sugar until stiff glossy peaks form, 3 minutes maybe 4. Gently fold about 1/3 of the beaten egg whites into the cake batter, and then fold in the rest of the whites until just barely incorporated. Pour batter into prepared pan. Bake until golden brown and springs back when pressed lightly; 50-55 minutes. Place pan on a cake rack to cool completely. While it is baking you should make the candied lemon slices. Put the slices in a small saucepan, cover with water, bring to a simmer over high heat; maybe 3 minutes. Drain, return to pan and cover with fresh water, repeat the heating. Do this three times total. It gets the bitterness out of the unpeeled slices. Put the slices back in the pan; add the remaining ½ cup sugar, 1/3 cup honey, the lemon juice of the two lemons and 3/4 cup water. Bring to a simmer over high heat, reduce heat to medium, cook, stir occasionally. 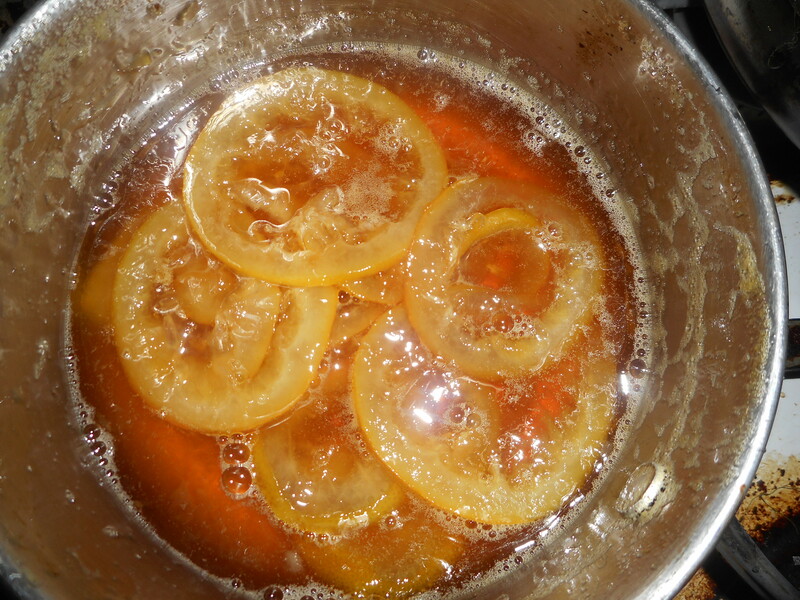 Cook until lemon slices are tender and the honey liquid is thickened; becomes like a syrup; about 20-25 minutes. Set aside to cool. Unmold the cake: run a knife around the edge of the pan, remove pan. Flip cake to take off parchment paper. Place on a serving plate. 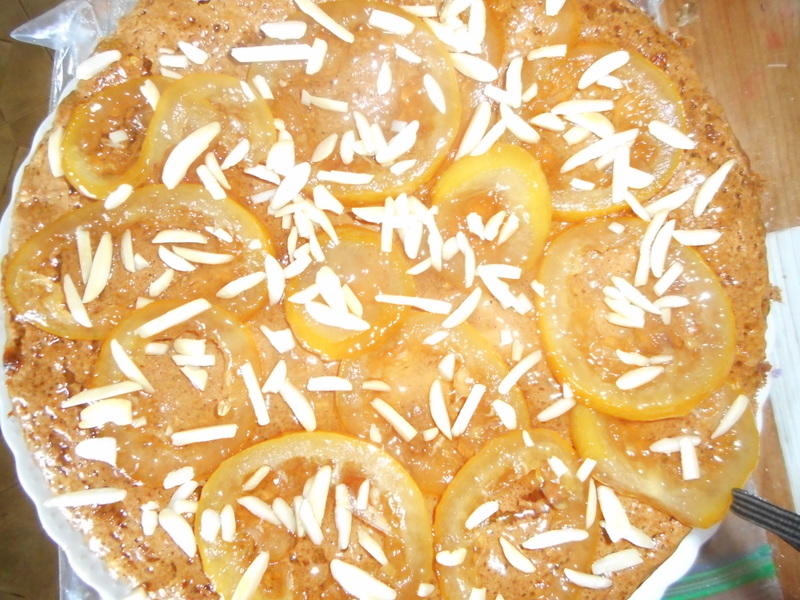 Use a fork to remove the lemon slices from the syrup and brush the cake all over with some of the lemon syrup. Then decorate the cake with them. 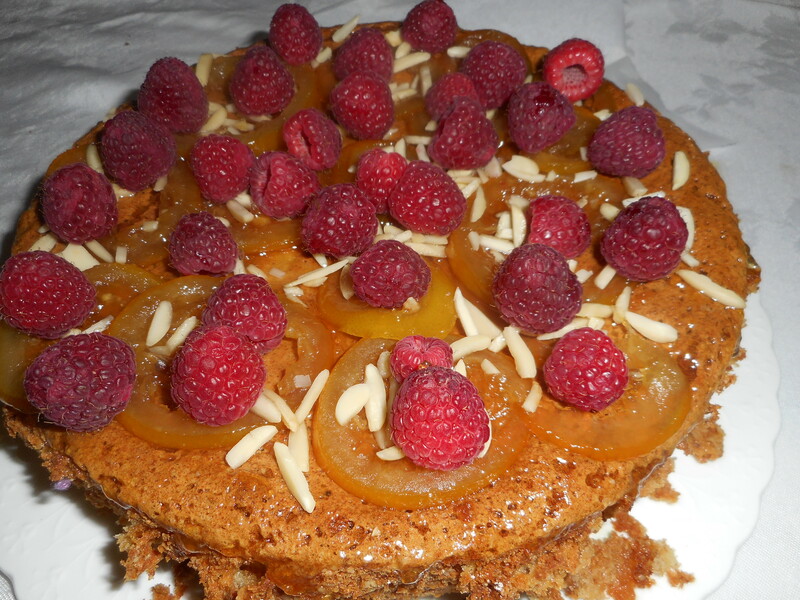 Sprinkle with the raspberries and pass the leftover lemon honey syrup along with the cake. Originally posted in the spring of 2015. My resolution this year was to eat less cake and I am doing pretty well at it so far but sometimes it is about using the ingredients you have and the holiday that is at hand. I have some egg whites in the freezer and have to use them up. Defrost and I have everything else in the fridge or pantry: go daffodil cake. Looks like an angel food cake on the surface but it is an old fashioned confection known as a daffodil cake. The insides have some white and some yellow cake. I found the recipe in my 1970s Betty Crocker, a great standard cookbook I would never want to be without. Was making it for many years before my diagnosis with celiac so once I got comfy baking gf I figured I could make it gf and it is perhaps even better than it was with gluten based flour.